The salmon are back and so is the Annual Winters Salmon Festival! On Saturday, November 4th, 2017 from 11 a.m. to 4 p.m. at Rotary Park (201 Railroad Avenue) in downtown Winters, enjoy live entertainment and mouthwatering local food while getting an education on all-things salmon. Headlining this year’s festival are regional performers including the folksy-rock band Muddy Waders and the acoustic bluegrass stylings of the Putah Creek Crawdads. A variety of food trucks will be serving up local favorites—be sure to stop by Winters’ own Buckhorn Steakhouse truck to try their special salmon sliders. At this year’s festival, learn more about the Chinook and their glorious return to Putah Creek by taking a guided salmon tour along the creek’s edge, or by visiting one of the many educational booths provided by groups involved with the restoration efforts. 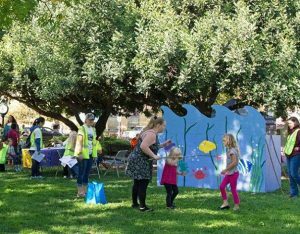 For the kids, don’t miss the storytelling and fly-casting stations brought to you by the Winters Friends of the Library and Putah Creek Trout. Also look out for the silent auction and raffle of regional artwork and artisanal goods where you can enter for a chance to win special prizes like a tethered hot-air balloon ride with Yolo Ballooning. Near the festivals end, bring the family along for a commemorative musical parade marching to and from the Putah Creek Bridge. This unique, educational community event truly has something for everyone—the salmon are thriving, let’s celebrate together! The story dates back to the seventies, but came to a head in 2014, when the future of the Chinook salmon in Yolo County’s Putah Creek was uncertain at best. Labelled a “species of concern” by the National Oceanic and Atmospheric Administration, the salmon were spawning at alarming low rates—as little as two hundred spawn were recorded that year in the creek, keeping in line with the distressingly low recordings taken since the early seventies. Indeed, the past four decades have not been kind to the Chinook. A combination of poor habitat conditions, droughts and local dam building has threatened the livelihood of the once thriving species. Though prospects seemed bleak for the Chinook, thanks to the years of joint hard work and dedication by the City of Winters, Solano County Water Agency, Winters Putah Creek Committee, Lower Putah Creek Coordinating Committee, Putah Creek Council, landowners and volunteers, the story of the salmon in Putah Creek did not end in 2014. In fact, the species has made a triumphant and heartening return to Putah Creek, with estimates of around two thousand Chinook spawn recorded by researchers in 2017. Improved habitat and drought conditions along with cutting-edge management practices undertaken by researchers has made all the difference for Yolo salmon, carving a new, prosperous path for these treasured fish—something that’s worth celebrating. Rehon, Anya. “Chinook Salmon Spawning in Record Numbers in Putah Creek.” The Aggie, ASUCD, 22 Jan. 2017.